One of the fears I’ve had throughout my life (aside from heights) is that my children, whenever I got around to having them, would not be readers. I’ve always been one. If you’ve read my bio on the About page, you’d see that the best punishment I could have received as a child was to be grounded to my room, because it meant uninterrupted reading time. My parents should have been suspicious when I never complained. So now I have two children, both boys, ages 7½ and 6½. Was my fear unfounded? Yes. At least for my older son. Of that I’m sure. But I’ll get back to him in a sec. While reading about kids reading, I stumbled upon an article in the Washington Post by Valerie Strauss about a teacher named Donalyn Miller, “The Book Whisperer.” She’s helped teach how to make kids lifelong readers, and in her latest book co-authored with veteran teacher Susan Kelley, “Reading in the Wild: The Book Whisperer’s Keys to Cultivating Lifelong Reading Habits,” she discusses five traits that lifelong readers have…traits you can cultivate in your young children. What I found so interesting about this is my older son is exhibiting ALL five traits — at age 7½! Woot! Son #1 is clearly a reader. There’s no doubt in my mind. And I think he will be for life. What fascinates me is that he started off rather slowly. Many kids can read by age 3 nowadays, at least a little bit, but we didn’t rush him…he learned in kindergarten, but he learned quickly, largely on his own. By the end of kindergarten, he was reading small chapter books. Throughout first grade, he progressed to longer and more difficult books (without ANY pictures), and now, just starting second grade, he’s plowing his way through Harry Potter. To me, that’s a huge progression in reading — from zero to middle grade fiction — over a two-year period. And he understands what he’s reading. It makes my heart burst with pride that he loves to read. He may gripe and groan when I tell him no video games or TV, but if he can’t do that and doesn’t want to play with his brother, he’ll curl up in a chair and just…well…read. For hours. As for son #2…well, the jury is still out. He’s learning to read more slowly than #1 did. As he starts 1st grade, he’s a marginal reader. But like #1, #2 is picking it up pretty quickly. What I do see in him right now is a desire to be part of the family reading community. Even if he can’t completely make out all the words. For example, he’s incredibly jealous of #1 reading Harry Potter (and the discussions we have about it around the dinner table), so #2 has decided that HIS first chapter book will be Harry Potter, too (mind you, he’s still on a “Green Eggs and Ham” reading level). He proudly tells me he’s “almost on chapter 9.” I’m sure he’s not really reading much, and likely understanding nothing, but right now, that doesn’t matter. What does is his desire to be a part of the family readership, sitting on a chair, legs thrown over the side, book in his lap, looking intently at pages covered with teeny, tiny words. He’s learning as #1 did that there are stories behind all those words, and if he practices, he can decipher them for himself. Entertain himself. Make himself laugh (especially reading Elephant and Piggie books by Mo Willems). For both boys, I don’t care much what they read. They’ve read non-fiction, picture books, magazine articles in “Entertainment Weekly” about the upcoming Star Wars movie, and laughed hysterically over Calvin and Hobbes (to the point that #1 was in such a fit of giggles he couldn’t read to #2 anymore). I also don’t bat an eye when they say they want books. Now sometimes I have to direct them to the right kind of book, but we’re happy to take a trip to Barnes and Noble and spend an hour in the children’s section. I’m sure the library would be a more economical option for us, but my older son is already proving that he’ll read a book multiple times. Might as well make it available to him. And of course, what the older brother reads, the younger brother wants to read, too. Especially if it’s about Minecraft. When he’s ready, of course (or so he’s told us). As the days pass, I worry less and less about the boys being readers. Naturally, they’re still very much preoccupied with Terraria and Angry Birds Transformers and football and friends. They’re boys. I expect that. But I love seeing them, heads bent over a book, as I listen to the pages whooshing. It’s eye candy and music to my ears. It’s time for a schedule update! Two weeks ago, I tapped out my schedule to get stuff done. So here’s what happened: Nothing. Nada. Zip. Absolutely no writing (or critiquing) has happened in the past two weeks. I’ve been consumed with new school craziness, trying to find a new “normal” with a different school schedule and the boys in two different, non-back-to-back tae kwon do classes, and surviving a home remodeling project (goodbye yucky carpet, hello wood floors. And a new door. Two, actually). Analysis: I’m pushing the whole thing back two weeks. Next week is my new start date. We have one more set of doors going in this Friday (our house is 12 years old and the Arizona sun bakes the heck out of pretty much everything…our doors have shrunk so much you can see light under the door AND under the threshold. That lets scorpions in. Need I say more?). I also have painting that needs to be completed on all the new trim where we had the floors put in. I’m still working my way through a stack of mail and other papers that have landed on my desk in the last two months, and then there’s the normal business of life. On a bright note, the tornado that has been my existence the last several weeks seems to be slowing down to a gentle breeze. Here’s to lots of writing days ahead. Starting next week, of course. This entry was posted in Favorite Books, Reading and tagged #amwriting, book whisperer, calvin and hobbes, cultivating readers, donalyn miller, eight ladies writing, elephant and piggie, good books, Harry Potter, Justine Covington, kids love reading, kids reading, mo willems, newbie writer, reading with kids, romance writing, teaching kids to read, writing tips. Bookmark the permalink. Last month we went to a family friend’s party, and his two daughters (early teens and mid-teens) were both glued to their kindles. The family had spent the day together in London, and the girls had chosen as their treat to spend the afternoon browsing in Waterstone’s. The older daughter, in particular, is a total bookworm and her total absorption as she read really reminded me of myself at her age (it drove my parents crazy). It made me so happy to see them. I remember many years ago my four cousins (who are all about my age and younger) sitting together in lawn chairs at the back of our yard during my parents’ 25th wedding anniversary party, all nose-in-a-book. They’d had enough of the party and were all reading. Love it! I was always a voracious reader – I would get up early and read a Nancy Drew before school. As for my kids, they’re split. 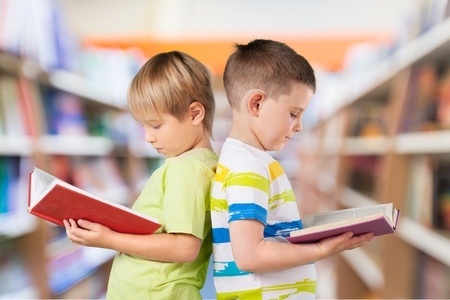 One loves to read and does it all the time – the other, not so much. He’s at the point where he’ll read what he has to for English class and that’s it, which isn’t going to inspire a lifelong love of reading. In eighth grade, they read Night (Wiesel), Animal Farm (Orwell), and, of course, the overdone Romeo and Juliet (Shakespeare). I can’t remember the others. Oh well, one reader. Justine: I could never sit outside and escape in a book if I was at a family event. When I wanted to read to escape, I had to go upstairs and hide in the walk-in closet, which had a light, or my parents would nag me that I wasn’t playing with the kids, or helping the adults, or whatever. A couple of years ago I had the occasion to clean out that closet, and now I know why I picked that one: my aunt had two fur coats! Very snuggly. Both my sister and I became fervent readers, so I kind of thought it’d be something that happened naturally. I read stories to my girls when they were small, and made sure they got a good start on English phonetics (since they were learning Japanese characters in school). But reading on their own came quite slowly. I think part of it might be a function of the Japanese writing system. Learning the Chinese characters can take years, so sometimes it’s very hard to find interesting stuff that has been written in characters for beginners. Or maybe I just approached things wrong. I didn’t pack a book in the diaper bag, but I always had pencils and pens and paper for drawing. They both turned out to be pretty good artists. And they love their manga. But as for reading text-packed books? Well, the youngest is starting to enjoy it quite a bit. I think the oldest still does reading mostly for other people’s sakes. When my oldest was a baby, I figured out how to hold a kid, a bottle, and a cardboard book all at once. EVERY time he got a bottle, he got a story. Same with the younger one. When they got older, I started taking lightweight paperback picture books in a “fun” bag, which was also filled with crayons, paper, and a small whiteboard and markers. There have always been books in the car, too. I think with a character-based language, things might happen more slowly, but I’m glad to hear your daughters are reading! (-: I was a rather selfish mother. I read for my own pleasure while nursing. (-: You brought back some fond memories of my old juggling act, though.